Verdant looked out across the city of wind although he had never been to Wind path before the smells of Mistrali food and the sounds of the people speaking Mistrali, brought back memories of growing up in Mistral. A wave of emotions washed over him as he spoke making his voice crack "I'm back in Mistral." Verdant quickly cleared his throat thinking no one heard that, he had to get it together, this was no time to get nostalgic. He had come back for a reason and he had a job to do Verdant thought. Juno had the sinking suspicion that he was being watched from the moment that he had stepped off of the airship. As unsettling as that was, however, he knew he couldn't allow that to bother him. Any tell of weakness could very well be taken advantage of, and bluffing or not, the Fang was still a threat, and had Caja in their possession. His eyes flicked toward Rory, then to the case slung over his shoulder. He hadn't received any instructions thus far, though whether that was a good thing or not remained to be seen. Nevertheless, he remained outwardly stoic, taking a brisk stride toward what seemed to be the center of the market, with his scroll in hand. Rory looked Juno's way and nodded. They would both have to be careful with what they said and did from this point forward, as any misstep could be fatal -- for Caja, and for them. When Juno answered the call it was an unfamiliar female voice, dripping with contempt, that spoke. "Juno Vert... welcome to Wind Path. I see you've brought a friend along. Caja's replacement?" The woman chuckled mockingly, though the tone of her next words was deadly serious. "Skirting the rules already, are we? You were told not to get any official channels involved, so there had better be a very good explanation... otherwise this poor lost puppy is gonna pay the price for your arrogance." The next sound over the phone was muted grunting and struggling -- it was impossible to tell for sure, but it sounded like Caja. After a few seconds the hateful woman spoke again. "Start talking, Vert! Convince me you'll play nice, or I'll start cutting little bits off of her ears." Juno's breath caught in his throat as he heard the woman over the scroll, doing his best to collect his thoughts in the face of her threats against Caja. He didn't know where they were. Not yet... But he didn't have to. He just needed to bide time until they led him to them. "...My arrogance? Or accounting for your oversight?" He replied once he found the words to speak, his voice even and calm, despite his anxiety. "I don't know Windpath, and I can't read Mistrali. My associate is here to act as a translator. He's nothing to be afraid of." Having regained his stance on the exchange, Juno stood up from the bench, bag in hand, and strode toward the edge of the waist high wall separating the east side of the market from the vast canyon. "I'm playing nice for the same reason you should be; because we both have something the other wants, and we could both very easily get rid of said thing. So what's more important to you? Getting the suit or hurting the girl?" The voice on the other end was silent for a moment after Juno spoke, a moment that seemed to stretch out further and further with each heartbeat. Whether it was deliberate and meant to mess with him or if something else was going on was hard to say; finally, after what seemed a tense eternity, the woman on the other end spoke again. "...You have some serious stones, Vert, I'll give you that. While I would relish the chance to make your lap dog regret betraying her own kind, we do indeed have business to attend to. Your tag-along can stay, for now, but know that we're watching every move you make. Now," His Scroll pinged as a map destination and route were received. "This is where you're heading. You'll receive further instructions once you've arrived -- do not deviate." With that, the call ended as abruptly as it began. The directions led away from the nicer, more commercial parts of Wind Path and towards the slums. Rory's visor, running a translation software he'd downloaded before leaving Vale, was able to direct them well enough when it came to road signs and the like, but it wasn't long before they were well past the point where any but the barest signs stood to direct travelers. This was the Wind Path not of arts, culture, and mercantile -- this was the Wind Path that worked the Dust mines of the canyon, and here squalor and desperation were the only things to decorate the bleak living conditions. Of course, most of the residents were Faunus; if the Fang was making a statement with their route choice it certainly wasn't a subtle one. Houses rapidly gave way to shacks and run-down looking apartments, and even the pavement of the streets turned to unsteady cobblestone and in some places nothing but well-trod dirt. This wouldn't exactly be a private place for a meeting, but with the Fang's influence in Mistral the difference would be minimal -- few had the luxury to care about what went on back here, so long as it didn't happen to them. If Verdant and Sam weren't careful, they'd stick out back here like a sore thumb. Juno and Rory certainly did; they could almost feel the eyes on them from half-concealed vantages as they made their way. Most were probably just residents wondering at the "rich folk" who'd traipsed into their uncaring corner of the city, but there was certainly the possibility that some eyes weren't quite so innocent in their gaze. Still, the two were left alone; no one came near them, not even those few who were almost certainly pickpockets. That in-and-of itself left an uneasy feeling with Rory. Without warning, Juno's Scroll beeped again -- they hadn't even reached the destination but the White Fang were already sending them somewhere other than expected. "They don't trust us." was all Rory said when he saw, but the meaning was clear: the Fang were playing with them, giving them false expectations to see how they'd react. It was a tactic to flush out any help they had along, break up coordination and planning. It also didn't mean much; as long as Sam and Verdant were keeping an eye on their Scrolls the live feed from Rory's goggles would be all the notification needed about the change in plans. Sam had separated from the group fairly early on; she'd been away when they were all getting off the airship, getting changed in a local toilet. Not the most glamorous of locations to do so, and not exactly the most glamorous clothes she was getting in to - but certainly a brighter getup. The normally darker jeans were replaced by a pair of slightly ripped denim ones, and a white shirt-skirt combo was over that, along with a roughed-up blue beige jacket. The setup definitely didn't scream 'trendy', but what it was - for her - was perfect for hiding herself in plain sight. Chains wrapped around her legs for once to hide them, rather than her arms, she looked completely different to her normal getup in several ways; the slightly less depressing colour scheme, the slightly more ridiculous set of cheap sunglasses, the fact some pale skin was actually showing for once, and the suitcase by her side. Oh, and the whole 'actually looked like a girl' thing. That too. Much as it alternately grated on and amused her that her team seemed somewhat blind to her gender, despite the fairly obvious evidence - she had short hair, but come on, that wasn't exactly rare - the farce she'd kept up out of curiosity proved useful now. If even her team wasn't exactly sure what she looked like when in a- she took a moment to look down at the clothes with distaste smudged onto her expression- then their enemies certainly wouldn't. Hell, she doubted her parents would recognise her at first glance like this. All in all, she'd done her best to look local - more importantly, looking like she was trying to get out of the place. The tattered clothes and off-brand names would hopefully help with that, and the fairly ramshackle looking suitcase would just add to the view, along with containing the rest of her gear. A tourist would have a mini one; the decent size hopefully showed she was trying to make a move somewhere. Perfect excuse for being around some airships. She took a small comfort in replacing her headphones, far too modern-looking to fit in at all, with a pair of earbuds - it's the little things that count. Feeling the echoes merge and bounce around her, she hummed quietly to herself as she walked through a not quite back alley but not quite main road of the slums, keeping to herself much as she could, scroll feed hotwired to her eyepatch-covered eye - less obvious than the usual bandages, but something she couldn't completely hide in the end - and tried to make her way towards the location from Juno's scroll, but also trying to keep a lookout for any possible White Fang grunts around the place. The key was the whole 'airship' thing - it was probably a fair journey off, or at least enough to warrant the security of a larger craft. As such, one thing they likely needed was supplies, and a light application of her semblance coupled with a handful of headache pills left her trying to listen in to anything sounding like gathering fair amounts of food or water. Verdant composed himself and walk down the street. He figured that the white fang where watching him as he walked down the street. He ducked into a local shop as asked where the bathroom was in Mistrali. The owner grunted a response and gestured toward the back of the store. Verdant thanked him and walked into the single person bathroom. Verdant looked into the speckled mirror of the bathroom and saw himself in his disguise, he was wearing a brown coat with an orange shirt underneath, he was also wearing grey pants with boots. Besides that, he had shaved his head into a short buzz cut and was wearing two small horns that made him look like a faunas. The horns where plastic and but you could only tell that if you touched them. Verdant looked vaguely like himself but a person could only tell it was him if they really looked. He then took off his backpack a assembled his bow, he took stock of what he was able to smuggle on the train. He had ten arrows total, two of which were explosive, one was an ice tipped dust arrow that could freeze a large area, another one was a smoke arrow. The remaining six where regular razor tipped arrows. He would have to be careful not to be wasteful and the retrieve whatever arrows he could. Verdant the put the backpack on and climbed out the window of the bathroom to get to the roof. There he followed Juno and Rory on the rooftops and jumping between the gaps in the roofs. Verdant followed Juno and Rory from the rooftops watching for any White Fang until they came to a warehouse district. He chuckled to himself at the cliche that the White Fang had a secret hideout in a warehouse district, what was this an issue of X-Ray and Vav? He was wondering why all bad guys did illegal dealing in warehouse areas when he saw a White Fang member a 200 yards out. He was watching Juno and Roy from a distance with a sniper rifle and was probably acting as the White Fang's eyes on Juno. The sniper hadn't seen Verdant because Verdant wasn't dead yet, so he decided to take the sniper out. Verdant went in a wide birth around the block to get behind the White Fang sniper. Verdant made a lot of noise going from roof to nearly falling off at one point until he was behind the sniper who had miraculously not noticed him. Verdant knocked the sniper out then took up the sniper rifle and stole the member's radio. A sigh of relief escaped Juno's lips as the woman hung up on her end of the scroll. Granted, that was likely the easiest part of this mission. Once they were within distance of the Fang, there was almost no telling what they would try to pull once they were in the same room, let alone what would happen when he turned over the suit's hard layer. He didn't have any reason to trust them to hold up their end of the bargain, but it was already clear that too much was at stake. He could only pray that his bluff would work. While Rory was rather jumpy as shops and restaurants gave way to condemned tenements and run down buildings, Juno maintained an air of stoicism, keeping his breathing even and attention forward as he felt the ever growing number of eyes on him. He and Rory were outsiders, well off in compared to these residents. Not to mention, all the eyes trained on him were of Faunus, and he was an Atlesian walking in on their hood. Nevertheless, his stone-faced expression didn't falter, his pace direct as he continued down the path, only for him to freeze momentarily and glare down at his scroll as the path suddenly changed. "Of course they don't. We don't trust them either." He remarked, simply shaking his head and starting off on the new path. "Stick close. I can't afford to let them get another person I care about." Juno's eyes narrowed as he looked upon the building they were meant to meet the Fang, noting the dilapidated structure and dangerous positioning. That was... one way to attempt to kill him and Caja, that was for sure. Snipers could have been posted at certain vantage points, too. And who knew how many people were posted inside that warehouse... Juno paused to take a deep breath, waving for Rory to follow as he moved for the directed door, suit bag slung over his shoulder. On the other side of the door, darkness awaited. Aside from a small number of thin, stark beams of daylight streaming down through holes in the roof there was no illumination to be seen -- it was like stepping into midnight with only broken moon fragments to light your way. The air was stale damp, smelling strongly of old wood rot and languishing iron rust... but also a faint hint of something akin to ozone, strangely enough. It was familiar, but Rory couldn't quite place it. Silence filled the air, punctuated only by a steady drip . . . drip . . . drip . . . that might have come from water pooled on the roof -- at least until Juno and Rory took their first steps inside, discovering that the floor had a very shallow layer of water sitting on it. Oh yes, this kind of setup had the Fang's signature written all over it: take advantage of their superior dark vision and hearing to disadvantage the humans from the get-go, a classic Faunus strategy. Rory was just about to switch his goggles over to infrared, aiming to even the playing field some, when the first floodlight snapped on and practically drowned the two students in sudden, sharp brilliance. Three more followed, all aimed at various spots on the liquid-covered floor in such a way that there was near-total coverage. It was nearly impossible to see anything past the bank of floodlights, positioned as they were atop a metal walkway about sixty feet up that ran across the wall opposite the entrance, though if you squinted and covered your eyes you might catch a glimpse of half a dozen rifle barrels peeking over the railing edge. "Juno Vert..." It was the woman's voice from before, the one that had taunted Juno on the earlier call. A sound of metal clanging could be heard, then a splash before an imposing figure walked into the edge of the light. The woman was built like a tower, six and a half feet of chiseled muscle clad in a sleeveless white tank top and close-fitting dark gray jeans -- what's more, both her arms from the elbow down had been replaced with brutal-looking mechanical prosthetics. 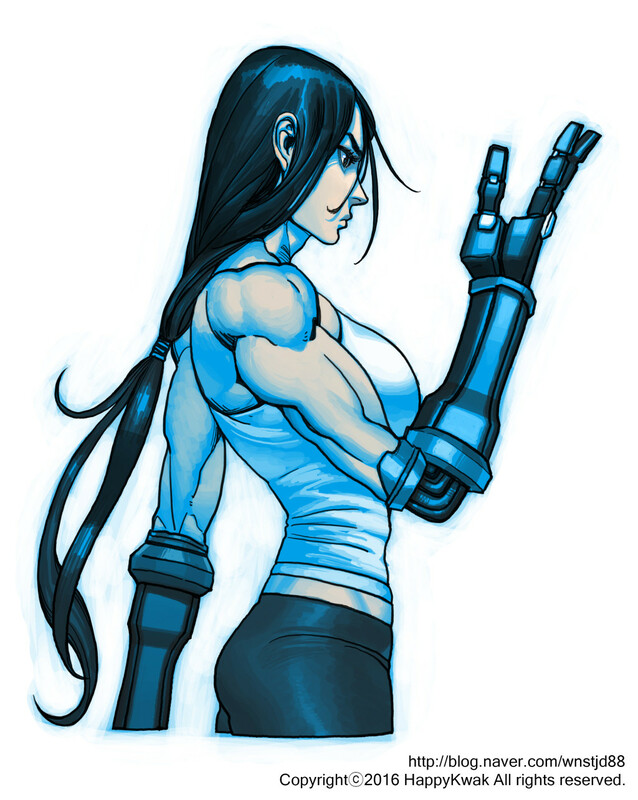 It wasn't Atlesian workmanship, to be certain, but her arms weren't junk either; someone in the private sector, possibly even the black market, had clearly been paid a fair lien to adapt a set of durable, practical, and combat-worthy industrial android arms for her use. Her smoke-gray eyes narrowed cat-like as they further adjusted to the light, a faunus trait to be certain, and beyond a brief glance at Rory they stayed locked on Juno with a glare that was both hateful and expectant. "I believe you have something for us, yes? Hand it over." Sam's keen senses and Semblance were picking up a good bit from her surroundings as she discreetly followed Juno & Rory into the industrial area. While White Fang operatives might be trained well enough to avoid detection by human sight and hearing they were comparatively easier to spot by their kin, and Sam was taking things a step beyond even that. She was picking up a scattering of life signs (breathing, pulse, slight shifting of restless bodies) from a handful of rooftops -- and ended up close enough to cleanly make out Verdant's approach and take-down of one particular sniper. If she and he coordinated, it might just be possible to take out the Fang troops positioned outside the warehouse. Doing it undetected... that might be harder. The sniper that Verdant had taken out had more than just a weapon and radio, it turned out -- the reason he'd been able to make such a successful approach was due in part to a half-finished candy bar that the Fang member had been in process of eating at the time, one of a dozen residing in a small supply backpack laid out alongside where the sniper had been set up. He had likely been so preoccupied with tracking Juno through his weapon's scope that he hadn't noticed how his own chewing left him exposed, something Verdant had inadvertently taken full advantage of. A quick inspection of the bag would turn up a spare ammo clip, a backup pistol, and a flare gun in addition to the aforementioned Pumpkin Pete's ChocoCrunch cache. "B-3, what was all that racket? This is supposed to be a stealth op! What's going on over there?!" ... was a bit more pressing of a concern. Sam gave a blink at the lack of airship - she would've thought it'd be somewhat difficult to hide a continental-capable travel vehicle - and then kept moving on. She trusted Verdant enough to get what he needed to do done; and the plan wasn't to ambush them here, anyways. Caja was the main objective, and while one person being disturbed was just happenchance, two people being disturbed one after could be called a coincidence. Coincidences didn't happen in their line of work, on either side of the coin. However, one thing she could do was eavesdrop. Moving towards where she would be able to hear the most absent chatter - some of those guards posted together must be getting a little antsy, after all - she tried to gather a bit of information on the situation, keeping one eye on the camera feed behind the bandage of her covered-up eye. As Verdant pocketed all the sniper's items including his white fang mask, he then heard the radio on the man's belt go off. There was a bit of static and then a man's voice on the other line. Verdant had no idea what to say to the man on the other end of the radio so he attempted to bluff his way out. "Uh, had a slight weapons malfunction. But, uh, everything's perfectly all right now. We're fine. We're all fine here, now, thank you. How are you? ", Verdant stammered out. The other end of the radio is silent for a long moment. "B3, stay put. I'm sending someone to have a look at your... malfunction now." The radio goes silent. Verdant could tell from that way the man had responded that he didn't believe Verdant's bluff and as if to confirm his theory then heard the faint sound of footsteps against the rooftop not too far away. Verdant had messed up big time he knew that if they found out that he was a member of VCVS, Caja was as good as dead. He had to make this look like something else. Just then he remembered that he was wearing a disguise of some poor Mistrali street rat and just then Verdant had a great idea. He looked off the roof make sure he had a way to escape. After he saw one Verdant walked over to the sniper's unconscious body. He quickly searched the sniper's body one more time and found 8400 Lien, this would work he thought. As he was done with the search the group of white fang he had heard approaching made their way onto the roof Verdant was currently on. He then turned to the group of White Fang members that had come to kill him. "Who is this kid? ", said one of the female terrorists. Verdant held up the Lien to make them think they understood who he was, "Thanks for the Lien suckers." Verdant said with a grin. He then turned and jumped off the roof with them yelling after him. Just as his violet eyes had begun to adjust to the overall lack of light, the floodlamps forced him to close them, instinctively raising an arm as he directed his sight to the source of the intruding light. He didn't see much, just light, scaffolding, and ceiling, but he was certain that somebody was up there, and so long as that somebody had Caja, they were a threat. However, aside from whoever was operating the lights, nobody else was present. So where was Caja? They had her. He knew they had her. So where was she? "Where is she." he stated, cutting the woman off, venom and vitriol oozing from his voice. "You don't get the suit until I get the girl. So where. Is. She." The brutal woman scowled at Juno's response, clearly displeased, though at first she said nothing. With slow, deliberate steps she began to circle both students, keeping her distance but nonetheless maintaining her general sense of menace. "Brash. Direct. Intense. You're someone who hasn't been broken by the world yet -- you've always bounced back anytime you've been dealt a blow, always found a way over, around or through.." The scowl turned into something more primal, a fangs -- literal fangs -- baring snarl. "To think someone like you had a hand in my father's death. It's infuriating." She clenched one mechanical hand so tightly that Juno & Rory could hear the metal scratching and grinding itself, the hydraulics straining at their limits. "I should kill her -- take from you the way you've taken from me. I should make you SUFFER." She paused, seeming to will herself calm without breaking her stride. "...You realize we could just take what we want from you? You students think you're so tough, but we're the only ones with weapons here. I'll bet you --"
"Deadman's switch." Rory, who'd kept one hand in his pocket since before they stepped into the room, interrupted the woman with those two words. The woman's eyes -- and likely several of the rifles -- locked onto him immediately as he slowly pulled out a device, looking very much like a modified pistol grip or flight stick, with his thumb firmly depressing a large central button. This had been the idea he'd had back at the apartment, and he'd filled Juno in on the details with a paper note before boarding the airship. "Any of you attack us, or so much as whisper another threat against Caja, and I'll trigger the suit's explosive fail-safe." It was, of course, a bluff -- Rory had no idea how to build a detonator and Juno's suit had no such fail-safe. The "detonator" was nothing of the sort; it couldn't blow anything up, but it could detect and trace radio and Scroll signals, feeding the data right into his goggles. If nothing else, it would give them a way to track these White Fang operatives if things went south. Buying the kit from a slightly disreputable merchant in Vale had cost him most of his savings... but there was no higher calling, no greater need, than this. A long silence passed. The woman glared daggers at the boys but otherwise didn't act, only muttering profanities under her breath. Her next words were directed to her terrorist friends. "Open the crate." Two additional White Fang members, who'd been keeping out of sight amid some storage boxes along the back wall, stepped into sight. With a crowbar the pried open a large wooden box and dragged out its contents: it was Caja, blindfolded and gagged with her hands bound behind her. The woman with the mechanical arms strode over to her forces and gestured for Caja to be moved forward at gunpoint. "Here's how this is going to work, you bastards: you hand over the suit and explain how to use it. When I'm satisfied, the hostage goes free and you disarm your goddamn switch. Got it?" Sam would be just in time to overhear what unfolded in the wake of Verdant's theatrics. The nearest batch of Fang ambushers was laying low and in wait, their radio set low but still easily audible for someone with Sam's abilities. "A1 to all B teams, we have a troublemaker -- a particularly gutsy thief, it seems. B3 is down, B4 and B6 in pursuit. Take 'em out quickly and quietly; don't blow our cover until we get the signal." "Think it might be one of 'em?" The whispered comment didn't seem to be directed into the radio, as a moment later another voice replied. "Might be. Betcha B6 is gonna make a mess of it." "If they do, Gesa's gonna make an example out of them. This'll be, what, three strikes now?" "Four. It'll be latrine duty if they get off easy... and they won't, not after last time." "Hell. Let's not get wrapped up in that. You got a bead on this thief yet?" Verdant was now on the run from four Fangs. All were brandishing short blades and, despite having pistols at their hips, weren't firing. There wasn't even any shouting, and though they were running at speed it was clear they wanted to avoid drawing extra attention to themselves. One in the lead, the woman who'd spoken up upon finding him, had a somewhat different weapon from the others: a curved claw-like blade mounted to an upside-down T-grip. Not only was she better equipped, she was also a touch faster. Taking aim at Verdant, she practically whispered "Nothing personal, kid." before pulling the trigger and launching the blade, bound to a corded steel tether, at him like a harpoon. Sam gave a light mental tsking at Verdant's exit. He was the one who was meant to be good at this whole kind of sneaky stuff and he's the one who already got seen. Well, at least he was dragging away some manpower - it would make it a bit easier to sneak about that way for herself, though 'sneaking' wasn't quite the right term - more like hiding in plain sight, really. 'Gesa', though - a name for someone in a position of power there. If they're the ones handing out punishment, probably either an officer or the leader of whatever operation this would be called. The progression of Juno's own situation at the corner of her eye left Sam slightly anxious; she really needed to start getting set up. If they weren't going to have to follow them back - with Caja herself already here, no long term following on the airship back or anything meant that the fight was probably going to take place here. In that case, whatever weapon the grunt was using 'getting a bead' on her teammate probably wasn't a good thing. Using the noises to try and map the two White Fang members' positions, she made her way close as she dared without risking them taking any particular interest in her. Starting to channel her semblance into two of the chains wrapped around her legs, Sam muffled her footsteps and her suitcase as she made her way closer to the grunts, leaning against a wall out of sight from what position she could tell they were facing, and then made her move. Two chains shot outward, their noise silenced by the buildup of her semblance, and tried to wrap around both of the grunts' mouths - or at least near enough for her semblance to quiet them both. Whatever weapons she could see as she turned around the corner would be next - The chains would hopefully be close enough to silence the weapons if any shots rang out, but she'd still rather not get shot. Hoping it worked, she made to slam the two members' heads into each other and knock them out. Verdant ran down the alley with the four white fang members chasing after him. "Damn, they're persistent, aren't they?" Verdant said under breath, but he was still glad that they seemed to have bought his bluff; they would chase him and pull bad guys away from Juno, Rory, and Sam. Although they didn't have to be so persistent. He was trying to give them the slip, but it was seeming apparent that he would have to fight them. He couldn't use his bow otherwise they would know they where duped. If he was going to use his bow he would have to take them all out at once and quietly so they couldn't radio back to their command. Verdant could try brawling with them, he had been practicing his hand to hand combat since the tourney. He knew he could take one mook with hand to hand combat but four at once no way. So Verdant knew he would have to use his bow to try to freeze all the white fang members chasing him. Verdant his bow from his magnetic holster on his back and drew his only ice arrow while he was running. In one fluid motion, Vedant slid onto his knees and turned around to face the four people who were chasing him. Before they could react to his sudden stop of motion he drew back his bow and let his arrow fly. As the arrow flew rapidly toward the white fang, the sound of a gunshot rang out reverberating across the metal rooftops of the warehouse district. Lucky the arrow hit its mark and froze the white fang members in their tracks. However, the mass of ice that froze the fangs in place stopped the bullet as well shielding Verdant.